Cultures emerge to ensure the dominant class stays in power. Culture is permeated by unexamined beliefs, norms, and expectations that favor those who make the rules. That's why leaders are so powerful. They create the culture that will determine your opportunities, achievements, and in time, your health and happiness. There are not many corporate cultures that are psychologically healthy places for people to work. This came up yesterday when a senior leader of a former client informed me that she was beginning a career transition caused by the poor leadership of the once great company that is currently losing the battle to stay relevant to its customers. She asked me if I knew of any good places to work. As my mind quickly swam through my mental Rolodex, I came up with exactly one possibility. I said to her. Unfortunately, the quality of work-life has precipitously declined over the last 30 years. Everywhere I go, I see people battling with toxic levels of unnecessary stress caused by poor leadership. Mostly the stress is caused by the superclass of authoritarian leaders who undermine their talented workforce. You see today's typical corporate cultures emerged to favor the goals and motivations of highly competitive, white males. These are the people who are making the rules. Lately, I have been giving a presentation titled "Think Like a Goddess and Work Like a Genius" to women who work in large organizations. The talk is in high demand because many women find it extremely challenging to succeed in white male-dominated cultures. It's not surprising that most of the mentoring women receive is to adopt the behaviors and beliefs of status seeking, competitively wired white males. It's ironic that large sums of money are being spent on diversity and inclusion programs for organizations whose leaders want to homogenize their workforce. My experience is that if the dominant corporate culture supports work priorities and behaviors that are inconsistent with your personal values and goals you have to create a psychological fortress of habits and standards that will enable you to create a work life that keeps you blooming in a garden full of weeds. Thinking Like a Goddess begins with the recognition that you have many other aspirations than career promotions, status, and money. Gender experts have long noted that when most men are asked how they define a well-lived life, they respond by talking about career, money, and things. Most women respond by talking about the quality of close relationships, family, health, security, and happiness. Most women simply think about a lot more things that produce deep satisfaction than most men. I call this difference Thinking Like a Goddess because for the Greeks the woman warrior goddess Athena must find harmony with the life nurturing goddess Hera to have inner peace. This is a much more complicated test than the typical male heroes journey. So the first thing I suggest to women is that you are aliens in your work culture and you will find not peace by being assimilated. You must be strong enough to create an inner culture that enables you to contribute your greatest gifts without losing your soul. 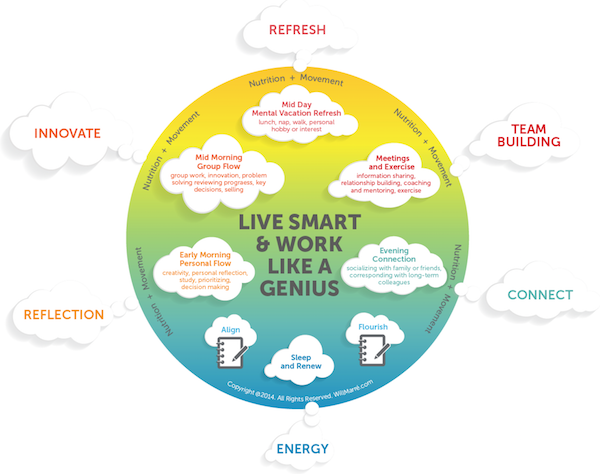 The Work Like a Genius part of the presentation is based on the avalanche of research over the last two decades about the daily habits that produce happiness and optimism, health and loving relationships, and creativity and productivity. Now is the first time in human history where we can apply the scientific evidence of physical and psychological health and happiness to our daily lives. What's particularly attractive to professional women is that the daily schedule of high-performing people actually requires you to invest in your most important relationships, your health, energy and personal growth. The science of human thriving reveals how to create a daily rhythm of work, love and play that makes you stronger and more effective at work and living the life you really desire. The bottom line is... Do Not Surrender! You are not insane. The fact that the rules, norms and expectations of your workplace may make you feel crazy may actually be a sign that you have retained a higher wisdom. The old world is crumbling. A new world is emerging. The birthing pains are awful but I am convinced a smarter business world will emerge as more women who lead like women create cultures that human beings can actually thrive in.